In the middle of all the arguments and to-ing and fro-ing of the debate upon how we should manage our uplands, the issue of whether shooting does or does not have a serendipitous conservation value is once again raging – just as it does every year with the opening of the grouse season on the 12th August, then game shooting and wildfowling today (the 1st September). At my level of consciousness (limited, it is true) the first blows were struck by Peter Glenser, Chairman of the BASC, in this article in the Country Squire Magazine. The right of reply was given to Dr Steve Carver of Leeds University here. There was a further piece written by Liam Stokes and more comments by Steve Carver at the end of Liam’s article. There were two things about Steve Carver’s response which caught my eye. The first was his use of the term ‘symbiosis’ to describe the relationship between the predators who interfere with numbers of the game species such as pheasants and grouse. Symbiosis is the term ecologists use to describe two species who live in close proximity and whose habits are in some way mutually beneficial. It is a bit more complicated than that, so I quote verbatim the opening paragraphs from Chapter 13 of ‘Ecology – from Individuals to Ecosystems’ . “No species live in isolation, but often the the association with another species is especially close: for many organisms, the habitat they occupy is that of another species. Parasites live within the body cavities or even the cells of their hosts; nitrogen fixing bacteria live in nodules on the roots of leguminous plants; and so on. Symbiosis (‘living together’) is the term that has been coined for such close physical associations between species, in which a ‘symbiont’ occupies a habitat provided by a ‘host’. In fact, parasites are usually excluded from the category of symbionts, which is reserved instead for for interactions where there is at least the suggestion of ‘mutualism’. A mutualistic relationship is simply one in which organisms of different species interact to their mutual benefit. It usually involves the direct exchange of goods or services (e.g. food, defense or transport) and typically results in the acquisition of novel capabilities by at least one partner. Mutualism, therefore, need not involve close physical association; mutualists need not be symbionts. For example, many plants gain dispersal of their seeds by offering by offering a reward to birds or mammals in the form of fleshy edible fruits, and many plants assure effective pollination by offering of nectar to visiting insects. These are mutualistic interactions but they are not symbioses. So that’s it then: symbiosis is where there is a close physical association and a net benefit to both species. So when it comes to considering game species and their predators, we cannot say that it is a symbiotic association because there is no net benefit for both predator and prey. Consider a Peregrine Falcon which kills and eats a pigeon: whilst the Peregrine gains food, there is manifestly no advantage to the pigeon. Neither do the two species live in particularly close proximity – for obvious reasons. In fact ecologists, with admirable simplicity, term the association between predator and prey as a ‘predator-prey relationship’. They may get technical and further describe it as ‘density dependent’ or ‘density independent’, or even ‘functionally dependent’; but we have little need to worry about these nuances here. I needed to clear this up before proceeding too far because Steve Carver, in introducing the term, has confused his own argument. “…predator populations follow in close synchronisation, sometimes a year or two behind their prey species, depending on birth rates and populations. [See Figure 1 below] Thereby land management for shootable surpluses of game species also increases populations of predators such as mustelids, corvids, raptors, foxes etc….. Heavy handed predator control just creates a predator vacuum into which other predators flow, once the a territory is seen as vacant. This further perpetuates for yet more predator control. Figure 1 – Typical theoretical representation of population densities of predators and prey (Source unknown). Predator numbers depend upon the density of prey and fluctuate with a lag, of varying time, behind prey numbers (Figure 1). In game or grouse shooting, where numbers of prey species are inflated to very high densities, this will ‘drag in’ predators from outside and thereby increase the density of predators. When predator control is undertaken, this will create a ‘predator vacuum’ and so draw in more predators. Given high densities of predators, this will increase incidental predation upon species of high conservation value. Figure 1 above is a theoretical model, the actual picture often becoming a lot more confused over time, as indicated by Figure 1 here. However, as a rough guide, it’s not a bad one. This suggests that the first of Steve’s hypotheses stacks up – because it fits in with theoretical and observational studies. The second of Steve’s hypotheses suggests that the numbers of predators will also rise to much higher levels than normal, because the prey species are at abnormally high densities. This is open to some debate because, in the context of UK game shooting, the size of shooting estates is quite small and will support only a limited number of predators, because the size of the predator territories is a limiting factor. Additionally, the availability of surplus prey is limited over time, i.e. there is a very short-term glut of prey species and a limited number of predators, meaning that the impact of the predators is relatively small. This is in some ways analogous to the situation in the Arctic tundra where sudden peaks of voles and lemmings overwhelms the resources of the predators in the area to take out a given proportion of the prey. These objections aside, in theory hypothesis number two might stack up reasonably well. The third hypothesis is common-sense, except insofar as there is a time lag between getting rid of the predators and their return from outside. The rapidity with which predators re-populate the area depends upon the species – avian species are generally quicker to return because they are more mobile. Furthermore, they will tend to be younger individuals because these are the ones which disperse from their home ranges. It will often take a year or two for a young raptor to settle in and find a mate before it begins to breed and so exploit the prey in the area. This timescale of a year or two needs to be contrasted with the very short window of glut (i.e. seasonal) by the management of game birds. The fourth hypothesis is a product the generalist nature of most predators, who are able to switch from their preferred species to another, on an opportunist principle. A Common Buzzard, who might normally specialise in grouse chicks and voles on a grouse moor, will not pass up the opportunity of a Curlew chick, if one becomes available. 3.0 – Wolves, Moose and Caribou. So far, Steve Carver’s reply to Peter Glenser seems to hold up reasonably well. But a week or two after these responses were published by Country Squire Magazine, a paper was published from a Canadian study of the effects of controlling Moose in order to reduce the Wolf predation upon Caribou. The New York Times article which alerted us to the publication is here and the paper itself is here. Steve Carver’s response was to suggest that the Canadian management strategy undertaken by this experiment could be an example for UK game and grouse shooting to follow (and, by implication, simultaneously allowing rewilding into the frame). The species of particular interest in this paper is the North American Caribou, which is a group of subspecies of the Eurasian Reindeer Rangifer tarandus. There are four subspecies of Caribou; and the particular subspecies under scrutiny by this study is the Woodland Caribou Rangifer tarandus caribou which, as its name suggests, lives primarily in the boreal forests of Canada. Caribou have declined dramatically in recent years and so are of considerable conservation interest. One reason for their decline is given as the increase in numbers of Moose Alces alces and to a much lesser extent, White-Tailed Deer Odocoileus virginianus. These species have moved into the forests of Canada in much greater numbers because large scale logging activities have altered the mature forest into a mix of vegetation which favours the Moose and White-Tailed Deer, but also reduces the amount of arboreal lichens which is the main winter food of the Caribou. Along with the Moose come large increases in Wolves Canis lupus whose primary prey is the Moose, but which will also take Caribou. Sport hunting can be used to reduce the numbers of Moose. Wolves are primarily limited by Moose abundance. Caribou are primarily limited by Wolf abundance. 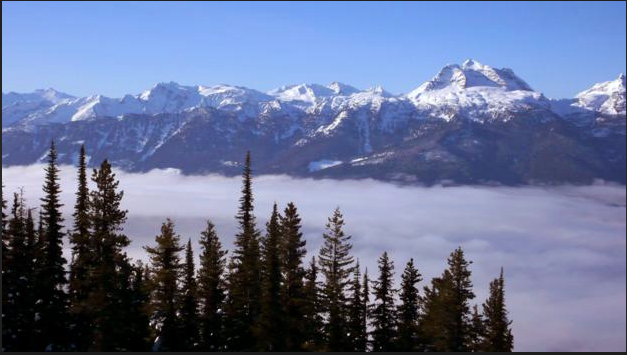 The study set out to test these hypotheses by dividing the study area of two mountain ranges within British Columbia into a treatment area and a reference (control) area. The treatment area was 6,500 km² and the reference area was 11,500 km². Within these areas, there were a total of five named sub-populations of Caribou of widely varying sizes. The numbers of Moose that were taken out was about 535 from the treatment area over the years of 2003 to 2005, whilst the numbers taken out from the reference area was about a dozen a year, which was usual practice. Wolf abundance was monitored using GPS and VHF collars on chosen individuals. Figure 2 – Number of Moose harvested in treatment and reference areas (Source: screenshot from Serrouya et al. 2017). Note that the numbers of Moose culled in the treatment area after 2005, continues to be higher than in the reference area. This is necessary to maintain Moose abundance at the desired levels, otherwise reproduction will simply build the numbers up again. Figure 3 – Moose and Wolf abundance in the treatment areas from 2002 to 2014. Note that wolf abundance monitoring was started in 2007. (Source: Serrouya et al. 2017). Note that Moose culling started in 2003, but monitoring of Wolf abundance only started in 2007, so there is a gap in information of four years as to what was happening to the Wolves. Although it is not possible to determine exactly when the Wolves began to decline in response to the reduced number of Moose, it is clear that a decline happened and continued until the Moose abundance levelled out from 2009 onwards. To test the effectiveness of severe culling of Moose upon the populations of Caribou, the abundance of each sub-population of caribou was recorded before and after treatment began in 2003. Figure 4 – Caribou abundance estimates, before and after treatment began (dotted line), for each sub-population (Source: Serrouya et al. 2017). In Figure 4, the top three graphs represent the fluctuations in Caribou abundance for the three treatment sub-populations. The bottom two are the same for the reference sub-populations. The Columbia North (treatment) and Wells Gray South (reference) are the largest sub-populations, each occupying about 20% of the total study area. The two smallest areas are Frisby-Queest (treatment) and Groundhog (reference). Columbia South (treatment) is intermediate in size. These graphs show that in the small and intermediate areas, Caribou numbers continued to decline dramatically after 2003, regardless of whether or not those areas had been subjected to treatment. The largest reference area (Wells Gray South) suggests that Caribou numbers continue to decline, but more slowly than in the smaller areas. Only Columbia North (treatment) shows a stabilisation of Caribou numbers, with the possibility of a small increase by 2014. As Caribou have a low rate of reproduction recovery from a high risk of predation to a much lower risk will clearly take some years. It could be argued that Caribou numbers will recover further but slowly. But from the paper, this cannot be said to be absolutely certain. The smaller areas and sub-populations are perhaps more interesting in that they suggest that lurking confounders are at play – such as food availability declines. Overall, the first two of the hypotheses listed above appear to be supported: i.e. that Moose numbers can be quickly reduced by sport hunting; and that Wolf numbers are limited by the abundance of their principal prey species (i.e. Moose). The third hypothesis that Caribou are primarily limited by Wolf abundance is much less well supported. Despite the apparent confidence of the title of the paper, the data suggest that caution (and a good deal more work) is needed before the success of the treatment can be announced with complete confidence. 4.0 – Are Wolves, Moose and Caribou relevant to British Grouse Moors? The Canadian Moose can be thought of in the same way as a pheasant on our hypothetical sporting estate. Both are introduced interlopers upon the existing natural environment. The Wolf, as a generalist predator (albeit one with particular preferred tastes), has its parallels in the Fox, Common Buzzard, Carrion Crow, Magpies and so on. The Caribou, as a native species with a low reproductive success, has its parallels in the form of (say) a Lapwing which mimics the low success of the Caribou because its reproductive strategy is intrinsically high risk. Caribou numbers appear to be limited by Wolves (but other factors may also contribute); Lapwing are limited by foxes and corvids (but are also limited by modern agricultural methods). Both Caribou and Lapwing are declining rapidly and both are of considerable importance from a conservation point of view. Both the Canadian study and the UK sporting estate operate strategies of continuous management. The Moose continue to be culled because of reproductive replacement. In the UK, predators are also continuously controlled both because of reproductive replacement and also inward migration from outside the area. The most obvious disparity is that of scale. Most UK sporting estates, even large ones in Scotland are a matter of a few hundred hectares at the most. The area for this Canadian study is 18,000 km² or roughly 87% the size of the whole of Wales. Its size and extremely rugged landscape is why monitoring of the radio tagged Wolves had to use a fixed wing aircraft in order to cover the vast area adequately. Size really does matter. The bigger the contiguous habitat, the lower the proportion of edge effect. This edge effect is important because the size and physical terrain limited the flow of Wolves and Moose into and out of the Canadian study area. This becomes even more important when there are hard, physical boundaries separating areas of interest and which limit or stop the movement of predators. There is a particularly rugged mountain range (Monashee Mountains – see Figure 5) to divide the treatment area from the reference area. Inevitably, this sort of physical barrier will slow up the immigration/emigration of large mammals in a way that does not happen in the UK – where many of the predators are fast moving, often avian and the landscape is nothing like as rugged as in British Columbia. The Canadian study had large mammals as its subjects. Population responses to increases in predation, and then withdrawal of that predation, tend to be measured over years. A sporting estate in the UK has a very brief surplus for little more than two or three months. This may allow those resident predators to gorge themselves for a happy, but ephemeral period; after that, prey populations return to normal levels very quickly. Increased numbers of predators moving into such an area to enjoy the surplus will quickly find a very lean period after the 31st January at the end of the shooting season. This inhibits the build up of a large number of predators during the breeding season that follows. The Canadian study was pursuing a path of indirect control: cut the numbers of Moose to reduce the numbers of Wolves, which in turn helps the Caribou. In UK sporting estates and smaller shoots, the approach is much more direct: reduce the number of predators to reduce the effect upon both the game species and the native species of conservation interest, such as Lapwing or Curlew. Perhaps the principal difference is that of the objectives between the Canadian study and sporting estates in the UK. The Canadian study had two problem groups which it wanted to reduce: the novel species (Moose) and the predator species (Wolves). A UK sporting estate has only one problem group: that of the predators (which, although they are more than one species, for the purposes of this argument can be considered as one problem). Conversely, the Canadian study had one native species as its conservation objective (Caribou): whereas the UK situation has two conservation objectives (Pheasant or Grouse, and Lapwing, Curlew etc). The UK sporting interest provides a huge financial benefit to the landowners and farmers. Much of that money trickles down into the local economy in the form of wages and the service economy. In addition, a great deal more money comes into the local economy because of tourism which is prompted by the landscape itself, managed jointly by farmers and the sporting interests. The amount of money that flows into the area in this way, far exceeds (on a per hectare basis) any equivalent amounts generated by the British Columbia landscape, magnificent though it is. In particular, the Canadian sporting interest will generate a tiny amount per hectare compared with the UK situation. Figure 5 – Monashee Mountains separating the treatment from the reference areas (Source: Google images). Steve Carver’s overall thrust seems to be that if UK sporting interests (and farmers) were to accept lower numbers of game for a shootable surplus (or lower yields), this would enable a ‘rewilded’ landscape to ‘improve’ ‘biodiversity’ and ‘wildness’. These claims are open to criticism and are unlikely to prove viable, for at least some of the points given above. So we can safely conclude that direct predator control works; and that its use is sufficiently rapid in its positive effects for species of conservation interest. It is swift and efficient in its effects. There are considerable differences between the British landscape and that of many parts of Europe and North America. One of the main differences is that of land ownership. Almost all land in the UK is owned by someone. Whereas much of the wild, undeveloped land in North America (and a good deal of Europe) is de facto owned by the state in the sense that exploitation needs licenses from the state to develop or extract from it in some way. In the UK the ownership of land means that the demand to make that land provide an income is very strong. This means that the land is worked very hard to provide the owner or tenant with an income. As this pattern of ownership has progressed over the centuries, the landscape has been shaped into what we see today – a highly diverse patchwork quilt of woodlands, fields and open spaces on a scale which is much smaller than in many other parts of the world. But it gives us a biological, social, economic, historical and cultural diversity which is unique and very, very special. If the rewilders wish to change all that, then they need an extraordinarily good reason to do so. So far, neither the rewilding movement as a whole, nor Steve Carver, have provided that reason. Begon M, Townsend CR, Harper JL (2006): Ecology – from Individuals to Ecosystems (Fourth edition). Blackwell Publishing, Oxford. Serrouya R, McLellan BN, van Oort H, Mowat G and Boutin S (2107): Experimental moose reduction lowers wolf density and stops decline of endangered caribou. PeerJ5:e3736;DOI10.7717/peerj3736. Potts GR, (2012): Partridges; Harper Collins, London. Newton I (2017): Farming and Birds. Chapter 13, pp 338-345. Harper Collins, London. Franks SE, Douglas DJT, Gillings S and Pearce-Higgins JW (2017): Environmental correlates of breeding abundance and population change of Eurasian Curlew (Numenius arquata) in Britain. Bird Study, DOI 10.1080/00063657.2017.1359233. Previous Brexit – will it lead us into an economic abyss? Next Should Wolves and Lynx be released into the British countryside? – Part 1: Introductions and Re-introductions. Your point about ownership in the last paragraph is remarkably prescient. It’s almost as if you have been eavesdropping on the recent internal discussions about a rather naff proposal for “rewilding” that is being put forward by a national charity, and which Steve has also been party to. The key question unanswered in the proposal is how the incorrigible connection between land and income can be broken. While there is a commitment in the proposal to so many hectares of wildland for a core area – although I question whether it will be wildland under a euphemism of a “process-led” approach – it only works if there is no expectation of a regular financial return from the land, which means you either have to own/control it (beneficial ownership), its publicly owned, or some private landowner volunteers to forgo that income. Not only is this not addressed, the need for engagement is missing in specifically paving the way for the paradigm shift away from mainstream conservation that has to happen for the core areas. Unfortunately, the rush to jump on the bandwagon of “rewilding” has brought in those who for convenience, or their own agenda, too easily water down the interpretation of that word just because it is easier to acquire funding for a soft definition and interpretation that fits more easily with mainstream conservation. These latecomers also lack the honesty to locate their less aspirational outcomes at the appropriate point within the wildland continuum, mostly at the bottom end of the wildland spectrum, but instead lump them all together with those that have more ambition for nature-led land. Anyway, I’m sure you’re not interested in these internal machinations. What I can say is that the second part of your last paragraph is rather absolutist, that wilding is a threat to cultural landscapes. I’m not going to argue about the value of a cultural landscape because I’m not interested in it, but I do think this is pushing the fear button when the likely penetration of nature-led lands into this cultural landscape is hardly going to significantly diminish and overturn its hegemony in Britain. In the same way that the “fake rewilders” confuse and obfuscate the need for nature-led land at the high end of the continuum, you must also not seek to deny those opportunities when that cultural hegemony has pretty much locked up our land asset. I don’t want to get in between you and Steve over grouse moors – I can’t get past the thought that grouse moors represent an unholy alliance between their owners and the management requirements of statutory nature protection in Britain, such as SAC, SPA, SSSI, with the public often picking up the bill. What I will say is that while you give a thorough explanation of the moose-caribou-wolf study, your connection then to predator control (slaughter) on grouse moors was a very wobbly inference. I am reminded of the utterance of Geva Blackett back in July 2007, then secretary of the Scottish Gamekeeper’s Association, married to the factor of a very large moorland grouse estate, and is again on the board of the Cairngorms National Park Authority, that managed moorland is “scientifically proven” to be more attractive to lapwing and plover. I’m enough of a scientist to see the illogic in this supposedly infallible science argument because, while the result may be true, it bears no connection to the real ecological relationships that happen in wild nature. Moreover, does this “scientific proof” forever deny a natural, unmanaged state for that landscape? Mark, many thanks for your detailed comments. You have covered a number of points that I think are worthy of closer inspection and response. However, at the moment I am busy with other things, and cannot devote the time to do your comments adequate justice. But I shall return to them fairly soon either on this individual blog, or in the form of entirely new blogs, because rewilding (or wilding) is a subject of increasing importance, and needs the time to be spent upon it. How we should live with predators and prey? The sharp eyed among you will have noticed that I’ve subtly changed the title of David’s blog post. I’ve done this because I feel we have a moral duty to share this world with all wildlife and not just that which we feel comfortable with or is beneficial to us in some way. This might be more pertinent to the subject of David’s current post on wolves and lynx, so let’s just leave that thought there as I’m sure we’ll return to it later in a future comment or two. I read this post on predators and prey with interest and more than a wee tinge of satisfaction that here was someone who had taken time to reply to the words I’d so carefully penned in Country Squire Magazine, so for that I thank you David. Time is clearly something that the original authors don’t have, as I haven’t received a response nor even an acknowledgement from Peter Glenser and Liam Stokes. Perhaps they are too busy? Or perhaps they believe I am beneath them? Or perhaps I have a point to which they’d rather not draw unwanted attention? If you’re coming new to this debate, I would strongly suggest you do as David has done and read these articles and my replies first before coming back to this response. David’s implication that symbiosis involves a close physical association and a net benefit to both species is a misreading of the ecological principles that even the reference he quotes makes clear. If you dig deeper into the ecology text books, you will find that symbiosis is used to cover a range of relationships between organisms. We can break the word down into its component parts to better understand its etymological origins in the Greek. “Sym” is used to indicate togetherness as in the words ‘symmetry’ and ‘symphony’. “Bio” obviously refers to life as in ‘biota’ or ‘biology’ and, of course, the “sis” at the end is used in converting nouns into verbs. In ecology, we distinguish several forms of symbiosis. I won’t go into them all here but they include parasitism, mutualism, commensalism, competition and, yes, predation. So, not all the relationships in symbiosis need to be beneficial to both parties. The example David gives of a peregrine falcon killing and eating a pigeon is “predatory symbiosis” because only the predator benefits. However, ecology is never simple and here we not only have to consider the individuals but also the population and the various and complex interactions between all members of the biotic pyramid and the edaphic conditions (climate, soil, geology, topography, etc.) in which they live. Nevertheless, let us continue with the example of the peregrine and the pigeon since that is the one David provides us with. When conditions are right, pigeon populations can expand and so the peregrines have a ready supply of food. As such, they too can expand their population in line with pigeon numbers; though this normally occurs a year or two behind the pigeons as it takes time for successful peregrine kills to be turned into eggs, chicks and fully-fledged mature peregrines. However, if the pigeon population collapses for whatever reason (it could be severe weather or lack of food supply) then the peregrine population will also decline as their prey becomes harder to find with fewer kills making them less able to feed their hungry chicks. Thus, we see the pattern of peaks and troughs in predator and prey populations that David shows in his Figure 1 wherein predator populations closely follow the fortunes of their prey, with the predators lagging perhaps a year or two behind their prey. How is this relevant to lil’ old England? Well, Peter and Liam both point out that the British landscape is heavily modified and managed by man with our keystone predators long exterminated. Yet they still bemoan the impact of too many deer (on forestry and crops) and the effect meso-predators (mustelids, corvids, etc.) have on game populations, which is why they maintain that they must be controlled if they are to have enough birds to shoot, and why management is essential to protect breeding wader populations. As with ecological models, this is an overly simplistic model that is biased towards a particular human goal; the shootable surplus. I, on the other hand, maintain that artificially high game bird populations, whether through moorland management for grouse or captive breed-and-release pheasants, is itself a significant part of the problem because it creates an imbalance in the biotic pyramid. If you constantly supress the predators in one area, you create the conditions for the over-population of their prey species which in turn simply attracts more predators from other areas and creates the spill-over predation on the non-game species that you purport to protect in managing for game. The basic ecology of symbiosis, sympatry and predator-prey relationships, together with the human modification of the landscape for agriculture and game is central to the problem. Density and function, both of which are spatially variant, are important and we ignore these at our peril. So, no David, I have not confused my own argument, although I do concede that things are way more complex than simple models suggest, and is why I conclude that more research is needed. Since writing my reply to Peter I have been talking to as many people as I can, both on and off the moor, to see if anecdotal evidence and experience confirms my suspicions. So far it has, and that includes conversations with keepers and shoot owners as well as conservation ecologists and representatives of the game industry. It is then interesting how that after questioning my reasoning on why these basic ecological truths are relevant in the context of driven shoots, you then proceed (in the main at least) to support my four central hypotheses. Yes, things are almost always more complex than they first appear, with lag times and the effects of human land management being good examples of complicating factors, but I must thank you for being yet another land-expert who agrees with my reading of the fundamentals of the situation. Did I mention rewilding? No, but now that you have we can return to that later. I think we have both read different things into this paper; as @Wayfaringhind jests “It’s possible for two logical individuals to reach different conclusions based on the same set of facts”. I can see where she is coming from! In my reading of the research, and my extrapolation of the lessons learnt to landscapes with driven shoots here in the UK, I see the introduction of vast numbers of non-native game birds (i.e. pheasants) and the intensive moorland management required to encourage shootable surpluses of wild birds (i.e. red grouse) as the equivalent of the moose and white-tailed deer seen migrating into southern British Columbia. The attraction of large numbers of meso-predators to this smörgåsbord of game birds is the equivalent of the wolf. The non-game ground nesting wader species are the mountain caribou, and thus, the spill-over predation of Red List species (curlew, plover and lapwing) is the equivalent of the secondary predation of the caribou by the wolves attracted initially by the moose. 4.0 Are Wolves, Moose and Caribou relevant to British Grouse Moors? In the mountains of southern BC, the cause of caribou declines has been the influx of wolves following the moose and deer. In the UK, the cause of declines in Red List ground nesting waders is (at least partly) the influx of meso-predators following the artificially high numbers of game birds on and, crucially, around sporting estates. In both instances, the displacements are conflated and confused by land use, management and climate change, but like I say, nothing in ecology is ever as simple as the models might suggest and human influences just make things harder to interpret (as well as generally making things worse). You then go on to mention the differences, and this is where things get even more interesting. •	Scale. Yes, size really does matter! But as a Geographer and a landscape ecologist I know that many, indeed possibly all, processes scale. This is true from the physical (e.g. drainage patterns) to the ecological (e.g. predator-prey relationships). What really matters is function and the species in question. In comparing the Canadian study to UK game shoots we need to bear in mind that the species are different. Wolves hunt in packs, can roam huge areas and correspondingly their territories are large. The territorial ranges of our individual meso-predators are by comparison much smaller and, critically, in proportion to the smaller sizes of the sporting estates in which they inhabit. It is nice to see you using Wales as a size comparator (why do people always do this?) but the thing about area to edge ratio is geometrically interesting since a circle of 18,000 km2 has the same proportion of edge as a circle of only 18 km2 and even one as small as 1.8 m2. This is important because when we consider the scale of the UK and its sporting estates in comparison to the species and the predator-prey relationships operating therein, they too scale accordingly, along with the barriers to movement such as urban areas, plantation forests, motorways, agri-deserts and keepered moors. So, in terms of basic spatial ecology, we are perhaps not that much different to the mountains of southern British Columbia after all. •	Time. The larger the animal, the longer its reproductive cycle tends to be. The critical thing here for UK sporting estates is that the game bird breeding season coincides with that of their natural predators. When Mr and Mrs Weasel have kits to feed, there are eggs and young birds to be had on the moor. When the kits are grown and have left the nest there is other prey available on the moor edge with which to fill the gap, such as rabbit, rats and mice (the effect of which must be beneficial to land management interests, yes?). The glut of ground nesting game birds and their eggs seen in the nesting season just makes sure that the predators are successful in their own critical breeding period when there are young mouths to feed, so I think your arguments about turn-over, breeding seasons and limited availability of game bird prey fall short here and are not very convincing. •	Direct-versus-indirect control. In Canada they treat the cause, here we treat the symptom. In Canada the cause is the incoming moose population encouraging a higher wolf population and spill-over predation on the caribou, here the cause is land management for a shootable surplus, the knock-on effect of which encourages higher meso-predator populations and spill-over predation on Red List species. The more enlightened direct control would be to treat the cause and manage for reduced game bird numbers and then be satisfied with walked-up shoots and a smaller bag. The indirect control is just to treat the symptom and practice heavy-handed predator control. This exactly what Serrouya says isn’t it? Reduce the thing which is attracting the predator (the moose) rather than try to cull them (the wolves). So, better to treat the cause, rather than the symptom? •	The differences. Ah yes, this is it. The nitty-gritty. It is all about control really. Control over nature, and some would say, control of the landed minority over the landless majority (but that’s a debate for another time). Spill-over predation is the inconvenient inconvenient truth. I say “inconvenient inconvenient” because the game lobby (CA, GWCT, BASC, etc.) often fall back on the peculiar fortunes of ground nesting birds and other species of high conservation value that have found a niche in our human-modified landscapes and micro-managed game shoots as a kind of conservation raison d’être for their primary activity of maintaining shootable surpluses of game birds. While I don’t doubt for a second that many keepers and shoot owners are deeply concerned about conserving these other non-game species, it is like I said to Liam… “shooting interests act as some kind of benevolent custodian; all seeing, all knowing, all powerful. You manage the landscape for the benefit of those species you like to shoot, accept those of no discernible economic value if they are otherwise benign, and control those that compete with you for your sport.” Curlew, plover and lapwing fall into the middle category and as such are merely a convenient side-benefit of the main concern which is the game species. The fact that these Red List species have become scarce in their traditional habitats due to the activities of intensive agriculture on land often owned by the very same people who tell us that their sporting activities in our uplands is essential for conserving the very species they have displaced is again another matter, but a point of some moral debate. •	Profit. I don’t doubt your arguments comparing the economics of hunting in Canada with the UK game industry for a second, but I do question their relevance. Your arguments about money and support for local economies are too insular for my liking. If you consider the whole equation of cost-benefits to the wider UK economy and our social well-being then we must question the sustainability of the driven shooting industry. Here I would point a questioning finger at all the downstream effects in both an economic and literal sense. I have written about this in ECOS (see: Carver, S. (2016). Flood management and nature–can rewilding help? ECOS, 37(1), 32-42. http://www.wildlandresearch.org/media/uploads/Flood-management-and-nature-ECOS-37-1.pdf) but in a nutshell, the potential ecosystem services from the UK uplands (and many a lowland one too) are perhaps far-better realised by alternative land uses to driven game shooting and all the negative externalities that it entails regardless of the limited (albeit locally important) financial benefits and the ‘sport’ of a punishingly small proportion of the UK population. I make no secret of the fact that I am pro-wild; be that wilderness in the true sense of the word, be it wild land or be it rewilding. I’ve said so in many an article, journal paper or online blog/tweet and I’m open about the fact that I’d like to see a wilder landscape in selected areas of the UK. You could in many ways say that it has been my life’s work. I’ve been behind the mapping that enabled wild land to be included in Scottish Planning Policy, I’ve been involved in developing and writing policy on wilderness protection in Europe and globally having co-authored the EU’s Wilderness Register and the IUCN Category 1b (wilderness) guidelines. I’m proud of these achievements. Not bad for a lad from Yorkshire with only 2 A levels eh? But you make another mistake in assuming that we want to rewild everywhere. We don’t. As I said to Liam “I’m far too fond of my food for that”. I also made it clear in my response to Peter’s puff piece that I’m not against all hunting or predator control, rather it is the style and way it is undertaken that I question. I think my good friend Mark Fisher has responded to you on some of these points, about the issues of control and ownership that lie at the hub of our relationship with the British countryside. For one, I see it as being all about control. It is what I say in my pinned Tweet: “Recent conversations underpinning my belief that land management interests don’t like rewilding ‘cos they feel threatened by lack of control.” You let the cat out of the bag early on in your blog when you said: “predators that interfere with numbers of the game species” …your words, not mine. Interfere. The implication being that the symbiosis between game birds and their natural predators is a natural process that you’d rather avoid and perhaps, like Liam and Peter, one that you’d rather not let on about? I don’t pretend to have all the answers, but I am prepared to ask the awkward questions that challenge the status quo. Here I am questioning a pattern of ownership and land management that is steeped in a cultural hegemony that keeps the common folk in their place and keeps our wildlife from being, well, wild. I hear what you are saying about the responsibility of land ownership, but that responsibility must extend way beyond production for personal gain, the livelihoods of tenants and your ‘sport’. It must extend outwards and realise its wider social, environmental and cultural responsibilities; what Leopold called “The Land Ethic”. Food production is undeniably a top priority (we’ve got to eat) but at the same time this shouldn’t be at the expense of the wider environment and long-term sustainability. If you haven’t done so already, I would strongly recommend Leopold’s essay on the Land Ethic (see: http://rintintin.colorado.edu/~vancecd/phil3140/Leopold.pdf). There is much food for thought in there on how we should live with and manage not only our predators and prey, but our land and people also. It ought to be clear if you’ve read anything I’ve written on this topic that I am very much a fan of continua. The landscape of Britain that you describe “a highly diverse patchwork quilt of woodlands, fields and open spaces on a scale which is much smaller than in many other parts of the world” is part of that continuum but one that could be so much more if we have the will and guts to make some real space for nature in amongst the bucolic ideal and not just the little bits here and there that are convenient to your way of thinking. This is what I call re(al)wilding (see: Carver, S. (2014). Making real space for nature: a continuum approach to UK conservation. ECOS, 35(3-4), 4-14. http://www.wildlandresearch.org/media/uploads/Making-real-space-for-nature-REVISED-VERSION-3.pdf). It won’t be appropriate everywhere, and perhaps then only in a few selected locations when the land ownership is favourable, but we must give it a try and on a landscape scale. Less strict rewilding principles can then be applied elsewhere and on a wider basis to realise the benefits that come from greater biodiversity and natural processes such as better water quality, flood suppression, erosion control, nutrient cycling, etc. In other words, treat the cause, not the symptoms. If you want a reason for rewilding, well there it is; a Land Ethic. We just need to learn to think outside the box that is ‘direct land management for direct profit’ and adopt a more ethical and egalitarian stance that extents not just to your fellow man but to the rest of the natural world as well.